CBS used a graphic to illustrate the number of terrorist attacks committed by far-right and Islamic extremists since 2001. The graphic showed that “far-right extremists” were responsible for 62 incidents that resulted in 106 deaths, while “Islamic extremists” launched 23 attacks that resulted in 119 deaths. The graphic noticeably left out the Sept. 11 terror attacks, with CBS only counting extremists attacks from Sept. 12, 2001 to Dec. 31, 2016. A total of 2,977 people were killed in the 9/11 terror attacks carried out by al Qaeda. The graphic appears at the 2:53 mark in the video. CBS anchor Norah O’Donnell asked Sessions what the Justice Department needs to do since attacks by far-right extremists have been more frequent. “This is believed to be the largest white supremacy demonstration in over a decade,” O’Donnell said, referring to the violence perpetrated by white supremacists in Charlottesville, Va. over the weekend. “We went and looked at the data, and in fact, between 2001 and 2016, there were nearly three times as many attacks by right-wing extremists than Islamic extremists in the U.S. What does the Justice Department need to be doing? Sessions said the Justice Department is focused on domestic terrorism and will continue to make it a high priority. 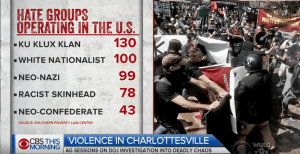 Late in the interview, CBS aired another graphic that listed the number of hate groups operating in the United States. The source for CBS’ information was the Southern Poverty Law Center (SPLC), which has a history of bias and being a left-wing advocacy group. It has been reported that SPLC overstates the number of hate groups and classifies organizations with which it disagrees as hate groups. CBS was not the only network to omit the Sept. 11 terror attacks from its reporting. MSNBC anchor Stephanie Ruhle did not include 9/11 on Monday when she claimed that right-wing extremists have killed three times more people than Islamic terrorists. “Reverend Al [Sharpton], I want to start with you. Between 2001 and now, we have seen three times more deaths caused by right-wing extremists than Islamic terrorists,” Ruhle said. Ruhle did not cite the source of her claim. Several reports show that since 9/11, Islamic terrorists have killed more Americans than right-wing extremists. According to New America, a Washington, D.C. think tank, Islamic terrorists have killed 95 people in the 15 years after 9/11, while far-right extremists have killed 67 people in the same time period. BuzzFeed also recently published an article on a report that left out a major Islamic terrorist attack. BuzzFeed published a piece last week titled, “This Report Says More LGBT People Were Killed so Far in 2017 Than in All of 2016.” The report from the National Coalition of Anti-Violence Programs claimed there have been 33 hate-violence-related homicides targeting LGBT people so far in 2017, while there were 28 such hate-violence-related homicides in 2016. The report left out the June 2016 Pulse Night Club shooting in Orlando, Fla, which took the lives of 49 people. There is no indication why the group left out the shooting, during which a man named Omar Mateen pledged allegiance to Islamic State leader Abu Bakr al-Baghdadi before opening fire on the gay nightclub. BuzzFeed noted the absence of the Pulse shooting in the subhead. I see NO mention of BLM murdering Police Officers either. What else would you expect from FAKE NEWS!! AND what an insult to all those who were murdered on 9/11 by Radical Islam!! Who says MSM doesn’t edit what they report toward a political end? Agenda, anyone? Of course, This is CBS, former home of Dan ‘I make it up as I go along’ Rather, so no surprise here. In another lifetime, I was newly married (one year) and had job ‘issues’. Those who know me know I held 40 jobs from age 16 until I landed as a credit card fraud investigator (TMCCC). I stayed in that job for almost 22 years! (Well, anyway) I was between jobs, and The Wife told me they were hiring. I applied, with the hope I would be working armed security (based on my job experience). Not only did they NOT hire me for security, they hired me a a line worker doing silicon wafer inspection, in a clean room suit, and, I was assigned second shift! Which meant I’d hardly got to see The Wife. But, they had a credit union, and health insurance, and I needed work. It was NOT the best of experiences. The crew was largely like those one encountered in the security business. Mixed education and experience, ethnicity and background. One manager was constantly sexually harassing the men, openly; one of the new guys was openly addicted to pills, and treated co-workers horribly. The harasser was left alone, because she was a long-term female employee. The pill-popper was ethnic, and so he was allowed much more leeway than if a White guy had been doing the same. One of the lead engineers was also a harasser, who didn’t get held accountable until years later. So, I worked there a little more than a year-and-a-half. And was miserable. The Wife and I DID get to see each other on weekends (she became pregnant in May! ), and I left der Fledermausflügel in November to begin my private investigation business. Why der Fledermausflügel, you ask? German for bat wings, of course! A new Harvard Business School study found that minimum wage hikes lead to closures of small businesses. “We find suggestive evidence that an increase in the minimum wage leads to an overall increase in the rate of exit,” the researchers conclude. The study, titled Survival of the Fittest: The Impact of the Minimum Wage on Firm Exit, looks at “the impact of the minimum wage on restaurant closures using data from the San Francisco Bay Area” from 2008-2016. Researchers Dara Lee Luca and Michael Luca chose the Bay Area due to their frequent minimum wage hikes in recent years. “In the San Francisco Bay Area alone, there have been twenty-one local minimum wage changes over the past decade,” they write. The Lucas found that lower-quality restaurants (indicated by Yelp scores) were disproportionately affected by wage hikes, increasing their likelihood of closure relative to higher-quality, established restaurants. While some studies find no detrimental effects on employment (Card and Krueger 1994, 1998; Dube, Lester & Reich, 2010), others show that higher minimum wage reduces employment, especially among low-skilled workers (see Neumark & Wascher, 2007 for a review). However, even studies that identify negative impacts find fairly modest effects overall, suggesting that firms adjust to higher labor costs in other ways. For example, several studies have documented price increases as a response to the minimum wage hikes (Aaronson, 2001; Aaronson, French, & MacDonald, 2008; Allegretto & Reich, 2016). Horton (2017) find that firms reduce employment at the intensive margin rather than on the extensive margin, choosing to cut employees hours rather than counts. “Currently, rising labor costs are causing margins in the sector to plummet. Those with the ability to automate like McDonalds are doing so… and those who don’t are closing their doors. In September 2016, one-quarter of restaurant closures in the California Bay Area cited rising labor costs as one of the reasons for closing,” McBride wrote in Forbes. “While wage increases put more money in the pocket of some, others are bearing the costs by having their hours reduced and being made part-time,” he added. As noted by Red Alert Politics, the Bay Area is headed for a $15 minimum wage in July of 2018, though they’ve already seen over 60 restaurants close since September. While it would behoove the Bernie Bros picketing for $15 an hour to take a look at this study, it’s entirely unlikely that such evidence would deter their entitled attitudes. It’s basic economics – businesses expect X dollar profit to be profitable – having the gov’t mandate paying their employees more money lessens profit. Something has to give. We’re seeing many more kiosks on restaurant tables and counters these days. A DIY Smoke Bomb ?! You’re lost in the woods, without phone service, and you need a way to signal your location to rescuers on the ground or low-flying aircraft. Your city is roiled in rioting and chaos, some bad dudes are advancing towards you, and you need to create a distraction to escape and evade them. It’s a weekend afternoon, your kids are bored, and you’d love to show them a fun and fiery science experiment. 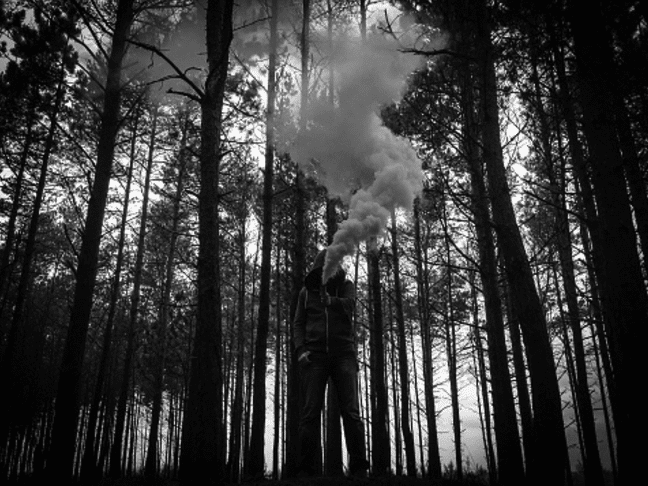 Whether for survival, tactical, or experimental purposes, smoke bombs can be employed in a variety of scenarios. They’re cheap, small and portable, and incredibly easy to make at home. You can keep them in hiking packs, car glove compartments, garages, etc. You never know when one will come in handy and either provide some weekend entertainment, or perhaps even save your life. Below, I walk you through the simple steps in making homemade smoke bombs on your kitchen stove. Note: You are of course playing with fire for this experiment, so be prepared and be safe. A bucket of water (or fire extinguisher) is good to have on hand, and when lighting the bomb, use protective eyewear and some sort of breathing filter/mask. The smoke can be toxic, and if the wind blows the wrong way you could be accidentally inhaling it. BE EXTREMELY CAREFUL THE HEATED MIXTURE DOESN’T REACH THE FLASH POINT WHILE MELTING! LEST YOU HAVE A SMOKE BOMB GO OFF IN YOUR HOUSE! ANYWAY, the link above and below lead to the the specifics for the smoke bomb. I highly recommend you do NOT use them for anything nefarious! Long time readers of this blog may remember my Life is replete with folks named Robert, Bob, David, Dave and similar variants. I was thinking this morning about someone who may have been the first. No, not the physician, Indian artist or mediator (as far as I know). He pretty much raised himself. His parents were older (and somewhat self-involved). I’ve no idea what his mother did. She seemed to be absent a lot. His father was a retired Air Force Lt. Colonel. He spent most of his time (when I saw him) drinking liquor in their living room (where we weren’t allowed) and listening to his music. His older brothers led their own lives, and seemed to be tangentially involved with raising him, trading off duties as it were. He had a younger sister with mental and physical issues. She followed us around like a puppy. The last I heard, she was living more-or-less on her own in assisted living. But Robert had innate talents. Auto mechanics, electronics. And he was the first of our age on the block to do cool stuff. And the one that really ticked me off: Became intimate with a girl. This ticked me off because he was two years younger than I! The last I heard, Robert got into computers and was working for the community colleges in this capacity. With another of my friends (from the magic club) named DAVID! And, with all the Internet tools now available, I’ve been unable to reconnect with him. Too common a name, I guess. David is in the wind, as well. There will be many posts on the blogs today regarding Memorial Day. Hopefully, most of them remind us that originally it was called Decoration Day, and that families took flags and flowers to remember those family members who had passed too early in war. Or had just passed. Sometimes they’d even bring picnic foods to celebrate the person’s life. Obviously, this has evolved into just a picnic holiday, forgetting the original meaning. After all, it is the official beginning of Summer, and we get off work, school, etc. And those who have gone before are still there, forgotten. And hey, Target has a sale! I remember one Memorial Day in 1977. My Dad drafted me to come with him to visit the grave of my Mother, who passed when I was in the second grade. We didn’t come here often, and being 24, I’d just-as-soon have been anywhere else. And, my Dad mumbled something about his joining her soon. I thought he was just being maudlin. Three months later he joined her. He knew something, and kept it a secret. Please take a moment today, while you’re swimming, fishing, boating, picnicking, drinking beer, or partying to remember those who have gone before. It’s the least you can do. And, as always, hug those still with you and tell them you love them. Do it NOW. You never know. We (both the firearms rights community and humanity) have lost yet another. I knew him through the Internet and other bloggers. He was both personable and knowledgeable. Of course, there was so much more to Bob than just a couple of dry paragraphs. Bob Owens is native of North Carolina who began blogging at the politics-focused Confederate Yankee in November 2004 before transitioning to this site in 2011. In August of 2013 he has been the editor of Townhall’s Second Amendment web site, BearingArms.com, where he now does most of his writing. He is currently working on his first novel, The Long Way Home, and has published a short Kindle e-book for people interested in purchasing their first firearm, entitled So You Want to Own a Gun. He is a Rifleman and volunteer instructor in the Appleseed Project, where he shares stories of our history and heritage and teaches rifle marksmanship, but mainly likes to play Line Boss. He is married to the girl of his dreams, and they have two children. I was told during an extremely low time in my life that being a father meant suicide was no longer an option. In spite of this, I’m not judging Bob – who knows what demons resided in his psyche? As much as people want to shun the FN 509 for being yet another polymer framed striker gun that is easy to overlook the hidden greatness, Brink’s saw the benefit in the new plastic wonder gun. The adoption of the FN 509 by Brink’s marks the first major purchase of the 509 since it was announced on April 17, 2017. There is no word on how many pistols Brink’s has purchased and what the details of the sale were other than a Dallas, Texas based FN Law Enforcement Dealer called TK Tactical brokered the deal between Brink’s and FN’s law enforcement sales team. We have previously covered the FN 509 on TFB TV and found the pistol to be a hidden gem that many will no doubt overlook when they are in the gunstore. If large contracts like the Brink’s one continue to be awarded to the FN pistol I expect we will see a ton more of the pistols in civilian hands. The press release can be found HERE, but I have pasted it below. (McLean, VA – April 25, 2017) FN America, LLC, the manufacturer of the world’s most battle-proven firearms, announces the award of a long-term firearms contract by Brink’s, Incorporated, a premier provider of secure logistics and security solutions throughout the United States. After extensive testing of all major pistol manufacturers over the course of nine months, Brink’s has selected the all-new FN 509™ striker-fired 9mm pistol and will issue the new sidearm to its armed security guards. FN’s law enforcement sales team worked with TK Tactical, an FN Law Enforcement Distributor based in Dallas, Texas, to develop the lead, and then directly with Brink’s to provide a firearms solution that met and exceeded the needs of its armed personnel. The first order of pistols will begin shipping in early June. Brink’s Incorporated, is the first major private security company to adopt the FN 509 since its official release in April 2017. The FN 509 was born out of the company’s effort to produce a contender for the U.S. Army’s Modular Handgun System (MHS) competition and has been further enhanced to meet the needs of U.S. law enforcement and commercial customers. Built on the proven architecture of the FNS™ Compact, FN made changes internally and externally to meet the rigorous performance standards of the MHS requirements and further developed the platform into the FN 509 with help from industry experts. Over the course of development, the platform has been tested extensively for reliability, ammunition compatibility and durability – totaling more than 1 million rounds. Check out FN America online for more information about the FN 509. Times have changed. Traditionally, private security has followed the coattails of the military and police, many times with mixed results. It took years for the civilian police to follow the military from revolvers to semiautomatics and even more for private security to get on board. Perhaps because most private security has less stringent training than the police, and pays less to support it. I recall working for another national security company, in the late 70’s. The post-issued weapon was a Colt Official Police revolver, of early manufacture, complete with five green rounds of .38 Special in the six-round cylinder. Issued in a right-handed Hunter holster (I’m left handed.) No reloads were supplied, and no training/qualification offered. AND, the barrel was LOOSE! I never pulled on it, for fear it would separate from the frame! It nice to see Brink’s stepping up to obtain quality firearms for it’s troops. Hopefully, they will be issued to all, not just the elite of the service.